In an apparent declaration of moose war, a Norwegian town’s deputy mayor says her town will do whatever is necessary to prevent Moose Jaw, Sask. from reclaiming the title of having the world’s largest moose sculpture. 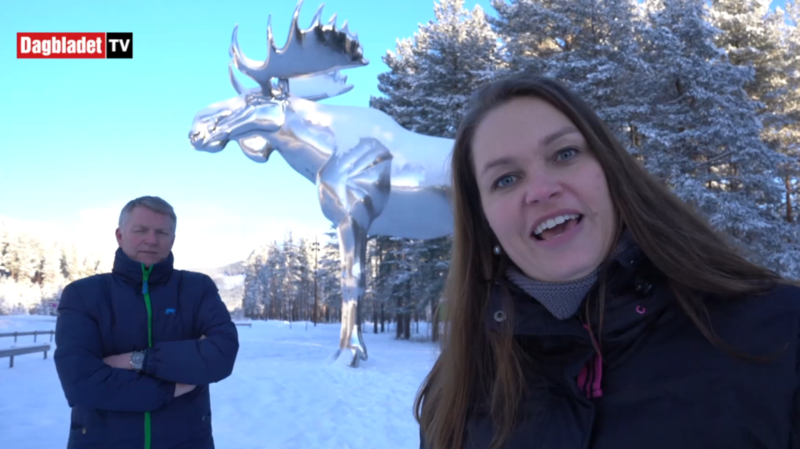 In a video produced by the Norwegian newspaper Dagbladet, the deputy mayor of the municipality of Stor-Elvdal said Moose Jaw had better think twice before entering into a giant-animal-sculpture arms race. “Sorry to disappoint you guys. We are going to continue our work to make sure that our moose is the biggest moose in the world -- for many years to come,” Linda Otnes Henriksen said in the video sent to CTVNews.ca. Her challenge comes on the heels of Moose Jaw Mayor Fraser Tolmie saying his citizens would do whatever it takes to make his city’s Mac the Moose, the tallest moose in the world again. For 31 years, Mac had been the world’s tallest moose statue standing almost 10 metres -- until it was dethroned after Norway erected its own giant silver elk statue in October 2015. And although there was only a 30-centimetre difference between the two statues, it was enough to steal the official title away. Tolmie said his Canadian city wanted its bragging rights back. “Canada’s national pride is on the line … and we can’t lose it to Norway over a moose,” he said, noting there was already a GoFundMe campaign underway. The city is hoping to raise $50,000 to hire an engineer to upgrade Mac. He said city officials were beginning to hear ideas from the public as to how to enlarge their moose. Some ideas included placing on a hat on Mac, giving him skates, a hockey stick or sculpting larger antlers. Henriksen added her Norwegian town had already gained the permission of the sculpture’s artist to not only make their moose potentially “twice as high” but to even repaint it in gold. She claimed the sculpture could be extended up to 20-metres higher. On Thursday, the Norwegian newspaper Dagbladet put up a poll on Facebook asking people to weigh in. A translation for the post reads: "Canada is waging a moose war against Norway. It is now a fight to have the world's biggest moose statue. Which one do you like best?" Out of approximately 13,500 votes cast so far, nearly 60 per cent of people appeared to like Canada's moose more. But a quick scan of the post's comment section reveal that at least some of the votes may have been cast by Canadians, who may be tipping the scales in Moose Jaw's favour. The poll is scheduled to close in a week.